Day 680 - Farewell, 2007! Hello, 2008! 2007 - the 2 and the 7 multiplied = 14, which is my birthday. Today is Day 680 - 6 plus 8 plus 0 = 14, which is my birthday. That means today is going to be a great day! This has been a pretty good year for us, all in all. Highlights? In May the new health club opened up in Franklin. Charlie and I love to go there and I'm already looking forward to summer again to swim outside. I got a new car in June, can't complain about that. I got a promotion somewhere around then, can't complain about that. Charlie retired, lucky dog that he is. We had MANY wonderful meals out this year, especially to Papa Boudreaux's! We had some nice trips and an especially nice Labor Day Week and Thanksgiving, with some especially special news! I'm sure I'm forgetting some highlights, but that will work for now. I already know that 2008 is going to be BETTER, much better! Have a nice New Year's Eve celebration, everyone! Be very safe and have fun! Talk to you next Year! TTFN! Day 679 - The Last Sunday of 2007! No time to blog, actually. I had to WORK for a little while this morning, so I am way behind already. Charlie and I are going out to run errands. Greetings, Bloggy Weekenders and 2008-Wanna-Be's! OMIGOSH - we slept in this morning until 6:30 - that is unbelievably late for us. Those must be retiree hours! So, what do YOU need to wrap up before the end of the year? I needed to pay my credit card bill online. Done. I needed to make a bank deposit. Done. I still need to use up at least one coupon that expires Dec. 31! It's for a buy-one-get-one-free Jack in the box salad. Their chicken club salads are quite good. This morning I am going to 8am water aerobics, and my new CRV is due for it's second maintenance service. I 'might' go do that after water aerobics, but only if they aren't too busy. A coworker came by yesterday to say 'I hope next year is better than this one was!' - I agree! I don't see any reason to think it will not be better. Big things are happening in 2008! 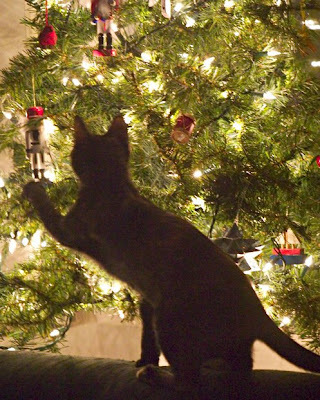 Are you taking your tree down this weekend, or leaving it up another week? I might take my cute little tree down tomorrow, boo hoo! Have a great Saturday and wrap up 2007! Day 677 - The Last Friday of the Year! It's Friday! Wahoo! I do like short work weeks. You know what to do, march (or stomp) in a circle chanting 'Fri-day! Fri-day! Fri-day! Fri-day! It's almost the end of 2007! Is there anything you meant to do before the end of the year? If the answer is yes, better do it! There isn't much time! It's almost time to start reminding myself that I'll need to put 2008 on checks I write. It's always hard to switch years. I had the strangest dream last night. Oh, big surprise! I was on a cruise ship and there was an 'international festival' on deck, with foods from various countries. I was going to try this round, stuffed bread and cheese thing from Mexico after being assured it wasn't too spicy. I said 'Si, Gracias' (yes, thank you) and the server corrected me that they say 'Nazia' now instead of 'Si'. (which they don't). The server wanted to heat up my food over a little flame brazier, and kept trying to light it and burning his fingers. I googled 'Nazia' and it's a middle eastern name and means nothing in Spanish. Great. Beware -second weird dream coming up! My other weird dream was just ridiculous. You know how in a cowboy movie they will tie multiple ropes around a horse or a bull to hold them still? I had a dream where multiple ropes were tied to either a marshmallow man or a snowman, so that it was 'tethered' to the ground. So, tell me, Doctor Bloggy, was it going to walk away?? Especially a SNOWMAN - couldn't it just MELT and ESCAPE?? Ha! Ah, Karen, the marshmallow man is an indication of your craving for sweets, and the snowman indicates winter fun. The ropes symbolically mean you are held back - possibly from both food and fun. That's really sad, isn't it? That will be $200, please. Pay the receptionist. Day 676 - Two days after Christmas! I shopped yesterday at Wal-mart after work and bought a couple of after-Christmas-clearance items. I thought I'd get trampled, but I didn't. I thought I'd never get checked out, but actually the only hold up was Wal-mart's now-famous-all-over-the-news gift card validation issue. The lady in front of me had a problem, but they finally got hers through. Mine worked the first time. Notice to Family - I got the new tree skirt that I've needed, I am using a green SHEET right now. $5. It's a red plush furry thing with a white edge like Santa's coat. I got a wintertime wreath that's now in the guest bath - it's red berries and green leaves. $10. I got a new bathroom shower curtain with the ocean and sandy shore on it. Nice! I got some other stuff like extra bags for my new vacuum sealer. I HIGHLY recommend it and I still can't believe it is so reasonably priced. Eeeek! It's 6:10 - gotta run! TTFN! Day 675 - Twas the day after Christmas! Greetings, Bloggy Back to workers! Or - are you on vacation this week? I wish I was on vacation this week, but I'm not. No use crying over spilt vacation hours. Hey! My 18.5lb giant turkage was WONDERFUL. (Sorry, Heather) Thanks to my turkey roaster and digital temperature probe, it came out delicious, moist and juicy, and just fantabulous! Thank you, Butterball. My apple/peach cobbler was yummy too. Hey - Charlie likes his ice cream on top of the cobbler, and I like my cobbler on top of the ice cream. Is that a problem? Did I tell you that I went into Publix two days before Christmas (when I got $87 worth of last minute items) and they had restocked the fresh Butterball turkeys? They had PILES of them in the meat department. I wonder if it was too late to sell them by that time, I'd better go see if they go on clearance, even though I would have to put it in the freezer. For post-turkey cleanup and freezing - I have been really enjoying one of my Xmas presents from Charlie. It's a Reynolds Handi-vac hand held vacuum sealer. You just vacuum out the air in the bags in a few seconds. No more freezer burn in MY house! Read about it if you want to - it works great and it is SIMPLE to use. I highly recommend it. It is now time to diet. I am afraid of the scale - it is calling me like Marley's ghost calling Scrooge! Lyn - I missed having Spanakopita at Christmas, that was the only thing I didn't have! Day 674 - Merry Christmas! Greetings, Bloggy Christmas Revelers! Merry Christmas! We've just finished our foame' lattes, using the Melitta coffee foamer that Cheryl gave me a couple of Christmases ago. Thanks, Cheryl! Charlie and I just heaved the giant turkage into the 20 qt countertop turkey roaster I use once a year. Correction! I use the roaster for king crab legs too. Increase usage to 3 times a year. Our enormous bird is cozily nestled in a roasting pan (lying in a manger? ), sprayed with butter Pam spray, sprinked with a savory mix of herbs from Harry and David, then sprinkled with a dusting of snow (that would be garlic powder), then bagged in a Reynolds turkey roasting bag, then monitored with a programmable meat thermometer probe that Heather gave me a few Christmases ago! Thanks, Heather! Nothing else can be done for this bird, Doctor. We've done everything we could. The Butterball turkey site would be proud of me, I think. Here is a running log of turkey-thigh-temp. 7am internal turkage temp: 45 degrees. 7:25 am internal turkage temp: 56 degrees. 9am internal turkage temp: 111 degrees. I cut the heat back from 325 to 300 at 9am because I can't remember if I cooked my turkey last year at 300 or 325 so I'll split the difference. 10am internal turkage temp: 129 degrees. 2pm internal turkage temp: 176 degrees. I have cornbread dressing in my NEW, small 6qt roaster, and I've discovered that three of my casserole dishes fit in it! Hooray! Gotta go open presents! More later! Gummy Vitamins from Charlie, to make up for the mean old lady at Sams Club denying me one. A necklace with sparkly crystals from Cheryl. 2 magazine subscriptions from Mom 'n Gil. Dark chocolate covered cranberries from Nantucket, candle and blankie from Heather. Several gift cards - two of them from Evan. A 6qt roaster-crockpot that I REALLY wanted from Charlie, plus one of those new hand-held Reynolds vacuum sealers, plus 2 calendars, a wall weather calendar and a desk Dilbert page-a-day, plus lots of other stuff like a cheese slicer, flashlight, and snow scraper. It is 10am and we just finished an outstanding breakfast frittata that Charlie made for us. YUM-O! Day 673 - Christmas Eve! 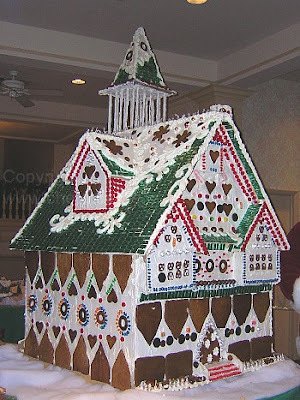 Here's a nice gingerbread house picture for the day. I caught up on quite a few things yesterday! I did my last minute grocery shopping, complete with last minute impulse buying. I purchased $87 worth of last minute grocery items we 'might' want to eat like Cracker Barrel bar cheese and Cool Whip, and Fritos and Sun Chips and Tortilla chips. I also bought a bunch of other needed stuff like milk and coffee creamer and the obligatory baby peas and pearl onions for Christmas dinner. In between football games, I made TWO batches of jam - one of 'black and blue' - half blackberry and half blueberry, and one of strawberry. Whoa! I rarely make two batches in one day, that is a few hours of work right there. No, my strawberry jam did not come out 'ugly' like my Thanksgiving jam. Good thing, because a jar of each is going to the neighbors later today. Notice - I am completely out of pint sized jelly jars, which I use most of the time. I looked in the guest closet where I stock boxes of jars. I have ALL 8oz jars left and no pints at all. Oops - who's stocking that closet? Uh, that would be me. So I made a lot more 8oz jams yesterday than I was expecting to. It's just as much work to make an 8oz jar as a 16oz, but you have to make MORE of them. We are going to the health club this morning, then to the movies to see 'The Golden Compass', and then having PRIME RIB and baked potatoes for supper. Could a day be any better than THAT? TTFN and have a wonderful Christmas eve! Don't forget your stockings! We just returned from a short but excellent overnight trip to Alabama - my first 'big' trip in my new Honda CRV 4-door color white. 220 miles each way. I have GOT to get busy and make lunch and make jam and grocery shop and unpack and finish getting ready for Christmas, etc. etc. Day 671 - Twas the Saturday before Christmas! 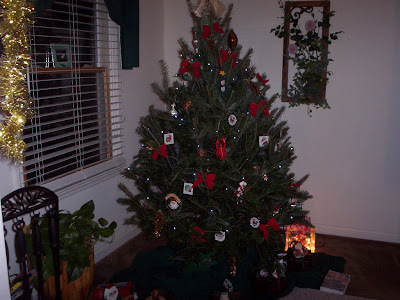 I chose this tree for the blog this morning because you can barely SEE the tree amid the presents! There appears to be a plant as well - no! Two plants! Are they waiting to be opened? I guess so! Here we are, the Saturday before Santa Day. I am officially off work until Wednesday. YES, indeedy. I missed the neighbor kids coming by last night to bring us some homemade Christmas candy. They always bring us something at Christmastime. Charlie said they stood at the door for awhile, letting him do all the talking (they usually don't say anything, just stare and smile a lot). They handed him a container of chocolate covered coconut balls, then the little girl darted forward and HUGGED him before they ran like the Dickens for home. HOW SWEET WAS THAT!! Adorable! I have GOT to make jam this weekend, because we always send homemade jam over to them and I haven't got a single jar made right now. My 'black and blue' jam gets hoarded by 'Dad' next door - he hides it and doesn't share it. I need to make two kinds so the kids might actually get to eat some of it. I don't know if they ever get any of it! So, you ask - if I give homemade jam to ONE neighbor - do I give anything to the other neighbors? The answer is no, but I would if they brought something over to US! Reciprocal giftage! Well, gotta go, have a wonderful weekend and I hope all your shopping and baking gets done! The only baking I plan to do is peach cobbler, and I need to pick up some ice cream for it. I also have no cranberry sauce (that's one of those things you usually have a can of in the pantry), we're out of chips and munchie food, and we're running low on all sorts of drinks. Charlie and I enjoyed some eggnog with nutmeg last night before supper, by the way... You make it from a dry powder and you can make one mugful at a time. It was very yummy. Day 670 - Doggone Tree! What do you think of this picture I found while I was hunting for Christmas tree photos? 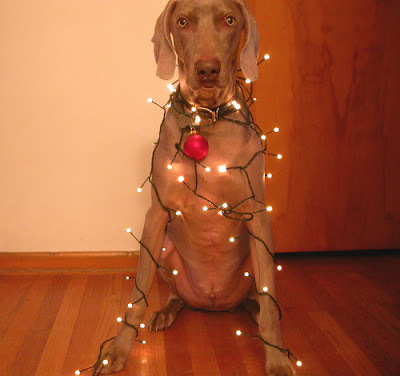 Poor Christmas pooch! I am wearing a Christmas turtleneck with snowflakes and snowmen on it. Whoa. Festive. Hey - have you finished your Christmas shopping? Time is running out! I actually need a few more things at the grocery store, not more presents. What is it about the holidays that makes you hungry all the time? Our supply of chips is about gone - no matter how many I get, we need more! After today I am off until Wednesday (yay! ), but I need more vacation days! I should NOT be at work stressing out, I should be relaxing and enjoying my little tree and my big turkey. (No, I was not referring to Charlie!) One third of our team at work will be off next week. I'm jealous. Speaking of Charlie... Since Charlie retired he has been invited to and attended TWO retirement luncheons for TWO MORE co-workers. He started a landslide at work. Please note that when he gets invited to a function, he can actually GO, because HE'S RETIRED! He won't be too busy at work to get away. Enjoy your weekend-before-Christmas! TTFN and Merry Christmas! Isn't this an awesome picture? Big news! I finally found my turkage, just in the nick of time! I am VERY happy. I am now the proud mama of a big, bouncing, fresh Butterball turkey. And it was the ONLY fresh whole one they had left at the Publix store I visited yesterday (as you recall, another Publix store I went to didn't have any left at all). Eighteen and a half pounds of turk-ish glory! Now you'd think that an 18.5lb turkey would be a tad large for a household of TWO, wouldn't you? Not with a freezer, it isn't! I don't want to be cooking another one for 6 months. I also bought a box of roasting bags for turkey. I opened the drawer that holds bags and wraps, and there was already an unopened box of turkey roasting bags in there. Oops. My bad. I decided today that I hate my socks. I have lots of socks, but I have only a couple of pair that I tolerate on my delicate, hate-to-wear-socks feet. It's going to rain later today, so I wanted to wear a particular pair of shoes that I prefer to wear WITH socks. Socks Sux. Have a wonderful Thursday before Christmas! I think I'm done with my Christmas gift shopping, and will just need some odds and ends like cranberry sauce at the store. TTFN! Day 668 - Wednesday already! Greetings, Bloggy Midlifers and Midweekers! 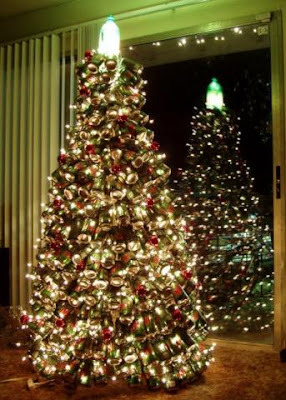 This Christmas tree photo is for Heather, it is made up of cans and bottles of Mountain Dew. If you know me, you know I also like Mountain Dew, despite the frightening color... I like Fresca too. I have noticed that people are in a GRUMPY mood this Christmas season! Do you think so too? We are very busy at work, for example. I have several things that have to be fixed or finished this week, and people are demanding. I got a request for a modification yesterday at 5pm. I had been at work since 7am, and I was still there. The Project Manager said 'I shouldn't hope for something to get done on this today, should I?' My answer was 'absolutely not!' Good grief! Plus, it's due on FRIDAY, when we were supposed to get out early, and we're off Monday and Tuesday. We SHOULD be coasting to the New Year and thinking only of sugar plums. People are tense and overreactive. Maybe it's just me? I don't think so. Let's talk about something NICE, shall we?? Like FOOD. Today we are having a pot luck luncheon at work. I am bringing gumbo (not too spicy, if you were wondering). We are also having chili, roast beef sandwiches, fruit tray, veggie tray, chips and dips, and various desserts. DELICIOUSNESS. Have a nice day and ENJOY these few days before Christmas!! Day 667 - It's beginning to look a lot like Tuesday! Thank heavens Monday is over. For your Christmas enjoyment, I stole this picture off the internet. Nice tree! Charlie and I had a delicious dinner last night with TY and SY at the Santa Fe Cattle Company steak house. They had a sign on the wall that read 'A day without sunshine is like, you know, night'. Ha! I had a Blackened Sirloin Salad, and it was really good. Everyone else had grilled catfish. We were a little later than usual getting there, because I got home late. To top off my rotten 666 day, I got stuck in a traffic jam caused by an accident, and it took me over an hour to get home (20 miles). So, Charlie - tell us what it's like being officially retired and not having to go to work! Is it everything we've been dreaming of? Speaking of Charlie - he is going to the post office this morning to mail a present to his granddaughter. This present has been in a bag in his truck since JUNE! Glad you're not a procrastinator, Charlie! Well, it's almost 6:00 - gotta go see what new and exciting things will come my way today! TTFN and get that Christmas shopping done! I still don't have a turkey! It's Day 666 - and I've already been working for an hour on an issue for work. MY day anyway is in keeping with 666. I also worked for several hours yesterday. TTFN and be careful today! Day 665 - Twas the night before 666-mas! There's a dusting of SNOW on our deck this morning, and it's 31 degrees. I guess I shouldn't complain considering the deep snow in New England! We'll be heading off to the health club soon, but I thought I'd say hello now while I am having my very delicious and gigantic foame' latte'. I also call it 'Foamationism' sometimes. Tomorrow is day 666, which is appropriate because it's MONDAY. However, it is the Monday before Christmas, so I can't complain. Five little workdays to go before I have a nice, long, holiday weekend. Charlie and I went to that 'no membership needed' food-service store - GFS Marketplace yesterday because they were having a 'customer sampling' event. We tried their prime rib, which you just heat up and serve, it is already cooked, and it was awesome. I liked it better than Sams Club's Ember prime rib, so we bought one. Still no turkey, but I am determined to get one this week. We might go to see Will Smith in 'I am Legend' later today, but no promises! TTFN and be careful in the snow! I went to my departmental Xmas bash last night and had a nice time! Me, my manager, and another co-worker sat together and gabbed till after 7pm! (it started at FOUR). Yes, I ate too much. I've already been up, had my water aerobics class, been out and about running errands, and made a run back to the house to eat and drop off some perishables I got at the grocery store. Good news - I got all the ingredients I will need for my Cajun Gumbo for our work potluck dinner on Wednesday. Bad news - this particular Publix store didn't have a single fresh Butterball turkey left, just fresh ones from their store brand. I'll keep looking. Good news - Heather, your package arrived! 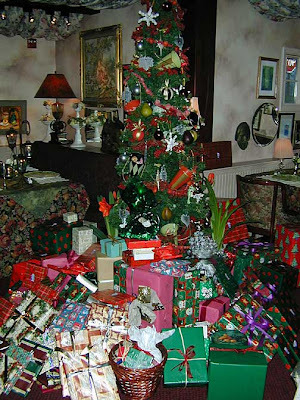 It is under the tree, waiting for Christmas. Bad news - I can't remember IF I mailed this one particular card and might mail it again. Good news - Lyn, there is a group of cards in one big envelope on it's way to your house. Day 663 - Twas the Friday before the Friday before Christmas! Greetings, Bloggy Weekenders! It's Friday! Woo Hoo! We are leaving work early today for departmental Christmas festivities which include FOOD, held at a nearby restaurant. I am looking forward to it - maybe I'll even learn some people's names that I have worked with for the past year and a half (not quite, but close enough). Okay, I'm looking forward to the food. I admit it. Team building is fine, food is better. Saturday is supposed to be my big 'finish up the shopping and get things done day'. The weather forecasters are anticipating 2-3 INCHES of rain that day, followed by snow flurries. Sounds like a wash out - I may have to spill over to Sunday to get things done. (Contingency planning in progress). No big deal, I don't have that much to do. I have just a few cards left to fill out, and then I'll do the 'as needed' cards. These are reciprocation cards I send to people who send us one. It's a courtesy - do you do that too? Hey, it's 6:10! Gotta go! TTFN and have a great weekend! Don't expect long blogs over the weekend unless I abandon some of my shopping plans. Day 662 - How many days till Christmas? Yes, Joe, I need to think of a creepy blog for day 666 - or not... My dreams might be enough fright for everyone! Speaking of fright... Are you ready for Christmas yet??? Less than 2 weeks till Christmas and I haven't mailed all my cards out yet. I have mailed some, though! Less than 2 weeks till Christmas and I haven't finished my Christmas shopping. Less than 2 weeks till Christmas and I haven't bought that turkey I keep drooling over. Publix has Fresh Butterball Turkeys for $1.39 lb., I'll get one of those unless I can get a better price somewhere else. Less than 2 weeks till Christmas and I haven't worn any festive 'Christmas outfits'. I am going to wear a Christmas-tree sweater tomorrow. Have a nice day and get that shopping done! Don't forget Survivor tonight! TTFN! Day 661 - Midweek already! It's Wednesday already - good! How are the Christmas preparations coming along? It was in the 70's again yesterday - a GORGEOUS day, and now they are saying it could snow by the end of this weekend. Eeeeew - keep the warm weather, Mother Nature! We have a cubicle decorating contest going on at work, and NOBODY who sits anywhere near me is participating. There are a few stockings here and there, and an exact replica of the Charlie Brown Christmas tree over near the Production Control department, complete with Linus's blankie at the base! In keeping with the holiday spirit, my manager brought in a 3-ft pre-lit artificial tree yesterday that she bought at her mom's yard sale and has never used. We are going to decorate that instead of our cubicles. I just pulled some garland and miscellaneous ornaments (I have a ton that I am not using) into a bag and I'll go decorate the tree when I get to work. Speaking of work, I'd better be moving along - it is already 6:07. TTFN! Happy Birthday to my brother Dave - I don't think he reads the blog but I'll say it anyway! Yesterday I left work early (because I worked on Sunday for a while) and went to the pool. I have a few blog-worthy stories of my time there yesterday. 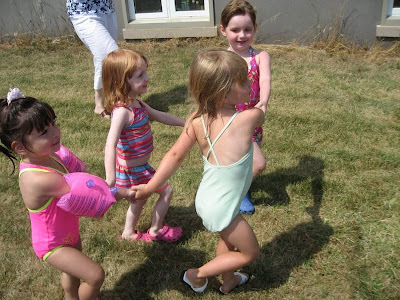 The 'tiny tots' swim instructor doesn't look much more than 16. She is very good looking and THIN. She strolled into the pool area yesterday wearing her one piece speedo swimsuit and those gigantic, Britney-Spears-wanna-be shearling boots. What a beautiful outfit. Anyway, back to my story. The little boy she was giving a lesson to spent his whole time (and his parents money) sitting on the steps, not wanting to go in. He did get on the noodle for a minute or two, but that was it. I don't think there was much of a lesson yesterday. His mother didn't look very pleased with his aquatic prowess. In the locker room, a fully clothed young girl with knee high, lace up combat boots came walking out of the sauna when I was headed for the shower. I was shocked that she could go in there with her clothes on and asked her - 'Aren't you boiling to death in there?' She said 'I was cold, I went in there to get warm!' Only a young girl can be THAT cold all the time. Well, it's after 6 - so that will be all the stories I have time for today! We're supposed to set another record high today, in the 70's again. No coat for me! TTFN! Day 659 - Moanday Moanday! I dreamed last night that I was being stalked and spied on by a couple of scruffy rednecks... Charrrrlie - better go on patrol outside! I'll call them 'scruffians' - low class ruffians. We set a record high temperature here yesterday - 73 degrees. Neither of us wore coats yesterday, obviously. The Titans SHOULD have won their home game yesterday, but lost it. We got a ton of stuff done yesterday, which I am very happy about. Was it because I didn't write the blog? We exercised, ran errands off and on during the day, fixed my garage remote control (that needed a battery), cooked, shopped, watched the Titans game on TV, ate yummy snacks, and I also had time to work on my Christmas cards and box up a few gifts! I also had a problem yesterday with my overnight jobs at work, and spent time off and on during the day working on that. Whew! Have a nice Monday, everyone! We'll be going out to dinner tonight for Turkish/Greek food! Day 658 - Even less time for bloggage! No blog today- chat with each other in the comments so I can write some Christmas cards. Day 657 - No time for bloggage! It's Saturday, and I'm about to go out the door to make my 8am water aerobics class, then go shopping. I have been 'browsing' various stores to try to decide on just the right turkey to buy too. I love fresh, minimally processed turkeys, but my purchase can be swayed by price! We have a code management system that saves your various versions of code and can show you the history of what has changed, who changed it, and when. What you click on to see it is 'View BLAME' - so you can blame the change that isn't working on the person who did it. Hilarious! Day 656 - Friday, hooray! I can't complain, this week has flown by in a blur. I think I left on time ONE day, I have been so busy. Water aerobics Saturday and Sunday - buy a turkey - go grocery shopping - write Christmas cards - and maybe see a movie. 'The Golden Compass' commercials look pretty interesting, don't they? No Survivor spoilers here - but did you see the LOOK James gave the remaining contestants when he came out at the tribal council meeting? Ouch, that hurt! Is anyone Christmas shopping this weekend? Early morning or late night shopping might do it for me. I am really not in the mood to hit the mall on the weekend and fight for a parking space. That reminds me not to go to the movie theatres in the mall either - I'll want to avoid those. Day 655 - Thursday already, and Survivorage! Here it is, our cute little Christmas tree this year. It doesn't look so little in the photo, does it? It's not very tall, but nice and full. It was just little compared to all the other trees in the entire Home Depot Christmas tree sales area... It is FINE, just FINE. You can't see the lights well in this photo, but they are blue. Tonight is Survivor night and Charlie's Chili night. I forgot to lament last week about James getting voted off Survivor! He was my favorite to win, but he was a 'saver', not a 'spender'. I have my VAT of foame' latte' beside me, and I hope you have a great Thursday! TTFN! Day 654 - Midweek already! Have you started your Christmas shopping yet? What? You're all done? Sheesh. I have purchased Christmas cards, a couple of Xmas hand towels for myself, and a few small gifts. That's all. Nothing else. Pretty pitiful. I have not written out any cards yet. Of course, if I tried, I could probably find 5 gifts around the house that I have purchased in the past and never given out! Every year I have high hopes of going outside and decorating the mailbox and mailbox pole. Never has happened. This is not a big gift buying year for me though, (family be notified), I am planning to write checks rather than purchase gifts! I don't think anyone will mind. Charlies son called a check 'a substitute gift card' recently, I thought that was funny. I am proud, however, that the tree is UP AND DECORATED, and all my wreaths are out (I have several). If I don't do any more decorating (is cleaning the house included?) I'm ok.
Well, it's 6am and the day is a-wastin' - have a nice Wednesday and TTFN! Day 653 - French Fries or Popcorn? I had very active dreams last night, but they were very unrealistic. One dream was of riding in a car on a very narrow ramp, thinking we were going to a parking garage, and then discovering we were going to have to back up the ramp (which would have been a disaster). I think instead we were going to collapse the car and carry it off the ramp. Good dream solution. I also dreamt of french fries. One person was bragging about the quality and quantity of french fries at a particular restaurant, and I had a lunch plate with a 'dream-fry' that didn't look like fries AT ALL! They didn't even look like potato. They looked more like lumpy cartoon food - there is nothing else to compare them to, because they don't exist. Hmmm. I got up, helped make the bed, checked my blackberry to see if my overnight job bombed, showered, got on the scale (still a bad number but not as bad as Thanksgiving week), dressed, read comments on the blog, read email, paid for a shirt I won on ebay, started drinking my giant foame' latte' that Charlie made for me, and now I'm blogging. It's after 6, so I'll make this short. TTFN and have a great Tuesday! Day 652 - Moanday, Moanday! It's time to rise and shine and hit the road for WORK. 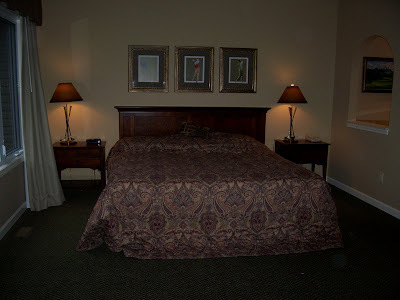 This is a photo of the master bedroom at the place where I stayed this weekend. It was SPECTACULAR, and had a jacuzzi room next to it. I was expecting 4 girls, but only two could come! We had a HUGE 4 bedroom (with 2 master bedrooms) 2300 sq. ft. condo at Fairfield Glade resort in Crossville, TN, but two of us managed to have a good time anyway. We went to Mennonite country on Saturday after setting off the smoke alarm in the condo by overcooking our toast. We ate the toast anyway by piling on my homemade strawberry jam. We bought some things there (Nancy, I bought more apple butter) and had homemade ice cream in big waffle cones instead of lunch. We tried to go to the movies, but it was an 'in between time' with nothing showing for 2 more hours. We hit a Christmas craft fair instead (go figure), then went back to the condo and watched 'Home Alone' for our Christmas movie. Sunday morning the winds really picked up and we had a power outage that lasted for hours - we had to get up and get around in the DARK! Sounds like a comedy of errors, doesn't it? Well, we had fun anyway and I will definitely go back to one of those villas again.